The following is a guest post by Sheffield Animals cofounder Dr John Miller. We welcome contributors to our project blog. Please email s.mccorry@sheffield.ac.uk for more information. 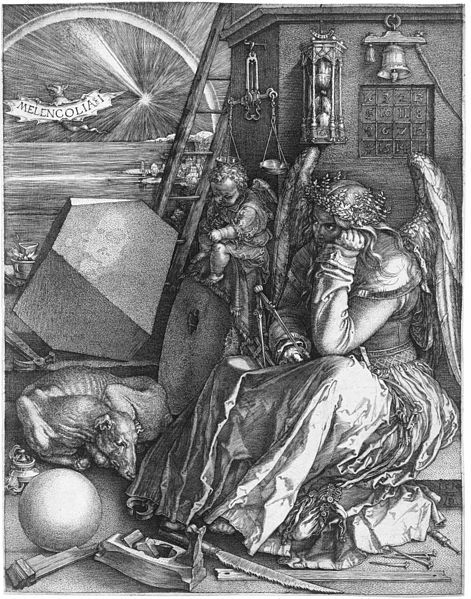 Albrecht Dürer’s 1514 engraving Melencolia 1 has attracted renewed attention in recent years for the significance of the animal at the feet of the brooding eponymous figure. This is commonly thought of as Melancholia’s Dog, in the title of Alice Kuzniar’s book. As John Ruskin wrote of the image as a whole, ‘What it means—no one knows’; its ambiguity runs parallel to Kuzniar’s memorable, exasperated confession in her broader study of humans and dogs that ‘I have spent hours trying to penetrate the minds of my whippets’. 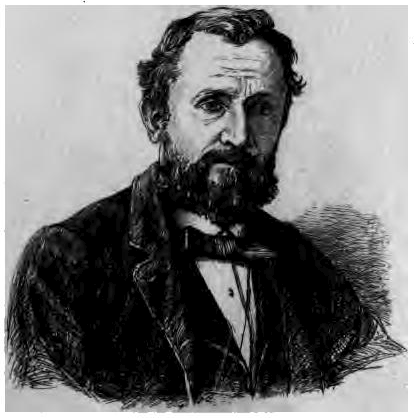 But for the Victorian poet James Thomson—the drunk, depressive, blasphemous, iconoclastic author of The City of Dreadful Night—Melencolia’s dog was no dog at all. As he explained in a letter to W. M. Rossetti, ‘I have been used to consider it probably a sheep, and as dead, not sleeping; in fact, a creature awaiting dissection, and suggesting anatomy as among the pursuits of the labouring and studious Titaness’. He can be forgiven for the mistake. Despite the canine position of the curled creature, it does have a sheepish look about the face. The realisation that critical orthodoxy was against him, however, prompted Thomson to include what he called a ‘villainous makeshift’ in the published version of The City. While the original draft shows Melencolia with ‘instruments of carpentry and science/ Scattered about her feet, in strange alliance/ With the poor creature for dissection brought’, the final form substitutes the ‘poor creature’ for a ‘keen wolf-hound sleeping undistraught’. Thomson’s preference for a dead sheep over a living wolf-hound in what he called his ‘animal stanza’ connects with a wider fixation with victimhood in the work of this remarkable but undeniably gloomy poet. Henry Stephens Salt, the prominent Victorian animal advocate and biographer of Thomson, claimed that ‘pessimist though he may be, his sympathies are entirely human’ (166), but this is only part of the story. There is little evidence of Thomson engaging directly with animals and animal causes in his life (although Salt mentions Thomson’s diary entries on a ‘poor strange cat’ resident in his coal-cellar). Nonetheless, his poetry (and also his neglected prose phantasies) express a distinctive evolutionary philosophy that makes a significant contribution to Victorian ideas about animals and particularly to questions of ethical responsibility beyond the human. Most importantly, the erosion of the human/animal distinction that Thomson foregrounds in much of his writing has a strong ethical dimension. The City of Dreadful Night insists on the entanglement, to use a favourite term of Darwin’s, of all creatures: ‘all substance lives and struggles evermore/ Through countless shapes continually at war, /By countless actions interknit’. This mutual involvement of lifeforms results in ‘A Lady of Sorrow’, Thomson’s most Darwinian piece of prose, in a remarkably inclusive attention to suffering and unfulfilled potential. ‘And what of the roses that are blighted in the bud, the lambs that are never sheep, the little unfledged things that never have their bird life, the saplings, the acorns that never grow into trees, the number-confounding spawn-germs that never attain definite individual existence?’ If this seems extensive to the point of absurdity, Thomson’s speaker anticipates such objections by countering ‘Of what use to sneer: This is not, this shall not be my brother! when you both issued from the same womb?’ Kindred – ‘fellowship and affiance and mysterious identity with all the being of the universe’’ – necessitates the acknowledgment of every form of life; it would be irrational in this schema to favour one kind of being and to neglect another. Thomson’s melancholy vision facilitates a mode of attention to the world and its denizens in which species is seldom a limiting factor.